As far as cognac goes, Louis XIII de Rémy Martin is pretty iconic. I’m not just saying that because they retail to the tune of £2,000 a bottle, though they do, but because it’s one of those cognacs that gets named in iconic films. You might remember it from the film that made Tom Cruise’s name, Cocktail. It’s pretty hard to understand the concept of a £2,000 drink when you compare it with the standard Remy Martin VSOP which can start as low as £29.99, both at 70cl. What makes this drink a serious luxury necessity? Trust me, the irony isn’t lost on me here. The Louis XIII is a blend of some 1,200 eau de vie, made from Grande Champagne grapes and aged between 40 to 100 years old. Each bottle is individually handmade by the craftsmen at Baccarat Crystal. I’d love to share just how much Louis XIII is out there but they are very tight lipped about that one. My first taste of the good stuff came at The Wellesley Hotel in London’s Knightsbridge, where the cognac is on display in its own locked case. It’s one of the few places in London which stocks the Louis XIII jeroboam. As you can imagine, there’s an art to serving the cognac. The golden caramel liquid is extracted using a pipette before being carefully transferred to the specially designed crystal glasses so that not a drop is spilt. The glasses themselves have grooves at the base which helps bring light to the cognac – apparently very important because the eau de vies have spent so long in darkness. The way that the light becomes fractals, in sync with the crystal jeroboam, is pretty spectacular. On this occasion I tried the Louis XIII with a Cohiba Aniversario Linea 1492 paired by The Wellesley’s resident cigar expert, Giuseppe Ruo. It’s a rich and smooth cigar reminiscent of Brazilian Bourbon coffee. Of course you want to know what the cognac actually tastes like. It’s extremely fragrant to begin with, and there’s lots of floral notes on the nose. Jasmine was called out. On the palate, it was a heady blend of caramel, Christmas fruits, spice, figs, sultanas and more. What really hits you is not the intensity, because it’s a very delicate drink, but the complexity. It can only be described as having the depth of flavour of whisky and soothing softness of wine. It is incredibly exciting to drink. Incidentally on the day that I had my first taste of Louis XIII, Pierrette Trichet, Louis XIII’s cellarmaster, was busy setting down eau de vie for the next three generations of master blenders. That’s another thing that’s hard to imagine – she will never see the fruits of her labour. But there’s something rather poetic about the way that Louis XIII flows from the hands of one cellarmaster to the next, generation after generation and decade after decade. Rather like the way the flavours of the cognac seem to go on and on. 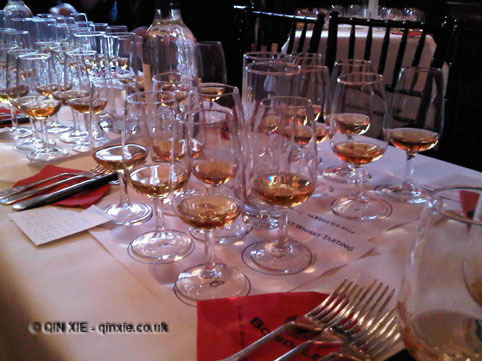 Remy Martin hosted the tasting in London. Amateur Wine was a guest at the event. You can find out more in our Editorial Policy. Earlier this year, I visited Antwerp in Belgium. As well as plenty of beer, Antwerp was also home to Elixir d’Anvers. Situated on an obscure residential street, the humble location of its distillery is not altogether different from the set up at Sipsmith gin. Except Elixir d’Anvers has been around since 1863. And the same distillery also produces advocaat, Elixir de Spa and some jenevers. You’ve probably seen Elixir d’Anvers as part of a cocktail menu. It’s one of those age old cure-all liqueurs invented by a chemist to, well, cure-all. Made with 32 exotic herbs and spices from all over the world, it’s a viscous canary yellow liqueur with a distinctive flavour. Can you tell what’s in it by the taste? Unlikely. When I visited its distillery, I was lucky enough to be in time for the end of the distillation when all the herbs and spices were being removed from the still. Recognisable were the coriander seeds and citrus peels but beyond that, after hours of maceration and distillation, it all looked a bit like steamy brown mush. Indeed the liqueur goes through a complicated and lengthy process of production. The ingredients are first macerated in pure alcohol before being distilled. After distillation, the “alcoholate” is then blended with pure water, sugar from sugar beet and yet more alcohol. Finally, the mixture is aged in French oak barrels for at least five months before being released for consumption. Warming, complex and seriously intoxicating, it’s easy to see why after so long in production, it’s suddenly seeing a revival on the cocktail scene.